We have spoken here in the past of small pleasures. Some, like a hot shower first thing in the morning, can be indulged in regularly, indefinitely and almost anywhere. Others, alas, must change with life circumstances and it is up to us, when that happens, to find replacements that don't only fill a void, but supply a different though equal satisfaction. Now that I am a year settled in to my new digs in a new town, I have come to realize how desperately I relied upon and miss New York corner delis. Nearly every block has one and so packed are they with the needs and minutiae of daily life that I long ago became convinced that, if necessary, one could live without ever requiring another source of goods. In addition, the corner deli is the neighborhood town square where micro-local gossip and information are exchanged, and the guys behind the counter will spot you a $10 or $20 when you're short. There are no corner delis in Portland, Maine. But there is a new pleasure here which, while not a substitute, I have come to appreciate as much as visits to my New York deli. Rain or shine, every Wednesday from April through October or so, you will find me at the farmer’s market at Monument Square in the middle of Portland's downtown. I go early, 7:30 or 8AM, because I like to be out and about in the morning air and it is a good idea to get to the stalls before the best stuff is gone. In addition to the fact that the fruits and vegetables are no more than one day from the vine so you know dinner will be a feast of freshness, market day is also a feast for the eyes and soul. It was raining a week ago Wednesday, one of those light, cool mists that makes everything – food, buildings, sidewalks – look all clean and shiny and new. The first growth of local strawberries was at its peak and you should have been at my house that evening for berries and cream. Wimbledon has nothing on the Bennett household in that regard. 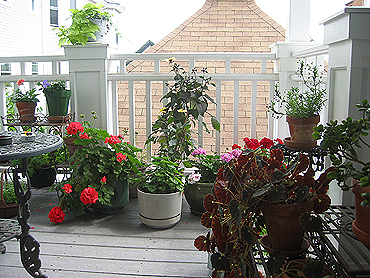 Meanwhile, back at Chez Bennett there is another new pleasure - my small deck garden. The sweet peas - new this year - are just beginning to bloom, the dahlias are growing strong and bright along with about five colors of geranium. I am pleased with a night-blooming phlox I bought at the farmer's market whose tiny flowers, closed up tight during the day, open at dusk wafting out a powerful and exotic fragrance I've never known before. There a few herbs too: basil for pesto, rosemary for lamb, cilantro for Asian dishes. But you can't see all that in the above photo. I will save them and the miniature Japanese willow for another day along with close-ups of some of the exotic vegetable varieties at the Wednesday market. Awesome pictures, Ronni! 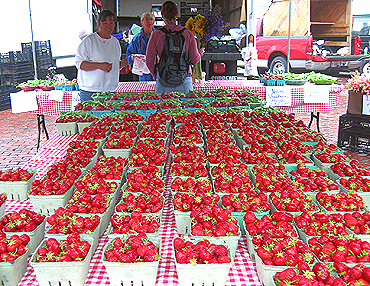 I love Farmer's Markets -- we have one here! Your deck looks like somewhere I would love to camp for hours! Knowing where our food comes from is important on so many levels. Ronni, you have given us a treat with these photos of such vibrant, fresh produce and flowers not only at the Farmer's market but on your deck. Whether we visit our local Farmer's markets or dig our hands in the dirt via pots on a patio or rows of home grown veggies in our back yards, some of us have been known to do this in our front yards as well, the very act of eating locally, eating fresh, nourishes so much more than our bodies. We connect with our ancestors and with our future. When I became a city dweller a few years ago, I quickly became a Farmers Market regular (my day is Thursday). Fortunately, I've gotten out of my early habit of overbuying: everything looks so good and is so inexpensive compared to the supermarkets that I would sometimes come home with enough produce to feed a family of four for a week. Yeah, Deejay, I did that at first too - bought everything in sight. I've been able to curb that instinct, but it still sometimes happens. I too enjoyed your market Ronni. Beautiful photos by the way! Your market looks so neat! I love the buckets of flowers all lined up in a row. You and I share something in common, Ronni: the farmer's market in New York City's Union Square. And thinking how heavily populated that particular market is with merchants from Pennsylvania's Amish and Mennonite communities reminds me of a small story from my current auto travels into America. In mid-Ohio, I encountered a large, beautiful, peaceful Amish community. There was a market, much like a supermarket, but with no familiar labels on packages: just plain white packages that said things like 'butter,' 'pork loin,' etc. Outside, one of the young Amish girls was collecting and returning grocery carts. I stopped to talk with her. As we talked, I told her I was from New York City, and asked if she'd been there. She said, "No, but we're hiring a bus next summer to take about 20 of us to see New York. Do you think I could find lipstick, if I wanted to buy some?" I live less than one hour's drive from Lancaster County, Pa. and often spend a day driving through the Amish farms. Many of them have their own produce stands and their vegetables and fruits are delicious.I especially like to go on Monday because that is usually washday and the clothes lines are filled with little purple shirts and black pants and white caps,etc. It is a photographers paradise to be in Paradise! I am so jealous of your farmers’ market. We had a fabulous one here years ago, but it fell into decay. Plans were drawn up a few years ago to start a new one, but those, along with the financing, vaporized. Guess I’ll just stop at the next pickup truck loaded with tomatoes and corn. Seems to me that you got the better deal by swapping the corner delis for the farmer's market. I have never drooled seeing corner delis yet your market: wow! I drool. I just love your deck garden Ronni...it looks so beautiful. It's the perfect place to sit and relax. Nothing like Farmer's Markets...I haven't really been to one in a long time. It all looks so good. Really nice pics Ronni. Ronni, your words paint a picture that make me want to jump on the next plane over! 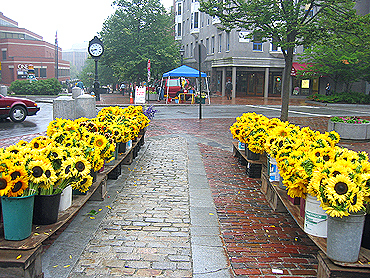 Oh, what I wouldn't give for a good Farmers Market. Sweden is wonderful in many regards, but the variety of fresh veggies will never be great, due to the climate. So - lucky you! :) I like your deck garden, too! Lovely. I, too, love Farmers Markets. Have had the same problem buying everything in sight. Your photos are really vibrant with color as are those of your deck garden. Our communities market is on Sun. morning. Nearby communities also have one on differing days, or afternoon to early evenings five other days of the week. I've had to resist going to every one. A unique and special one I visited earlier this year was on the Big Island of Hawaii near the volcano. So much, so good, I just couldn't resist. Beautiful photos, Ronni. Your color is outstanding; you must have a good digital camera. I am jealous as photography is my hobby. Your deck is so inviting. 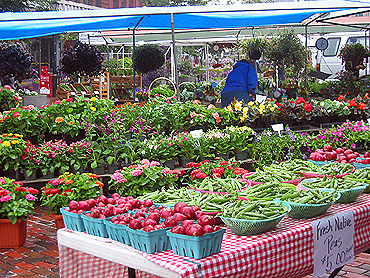 I wish I could get to our Farmer's markets. Of course, the produce is not as plentiful as yours; the desert is not gardening country, but we do have lots of fruit trees and vegetable gardens and you can go and pick your own at the farms. Now that's fresh! I love your roof garden. It looks trim and peaceful. I love farmers' markets and the pix are great.